Federal agency seeks public input on plan to make fuel blends with 15 percent ethanol available year-round. WASHINGTON, D.C.—The Environmental Protection Agency, or EPA, will be hosting a public forum at the end of March to receive input on Pres. Donald J. Trump’s proposal to make fuel blends with 15 percent ethanol available year-round. E15 fuel blends are not available at gas stations during the summer months due to environmental concerns. Allowing E15 fuel blends to be available year-rounds means the EPA would have to do away with restrictions during summer months; those using the 15 percent fuel blend would be able to take advantage of the Reid Vapor Pressure (RVP) waiver between June and September. The public comment period is open through March 29, according to the EPA. E15 sales are currently restricted by an RVP control, which prevents fuel blends with 15 percent ethanol from being sold between June and July. Trump, in October 2018, directed the EPA to look into allowing E15 sales for a full 12 months, replacing the current eight-month availability. Allowing year-round sales of E15 fuels has been drawing mixed reactions. 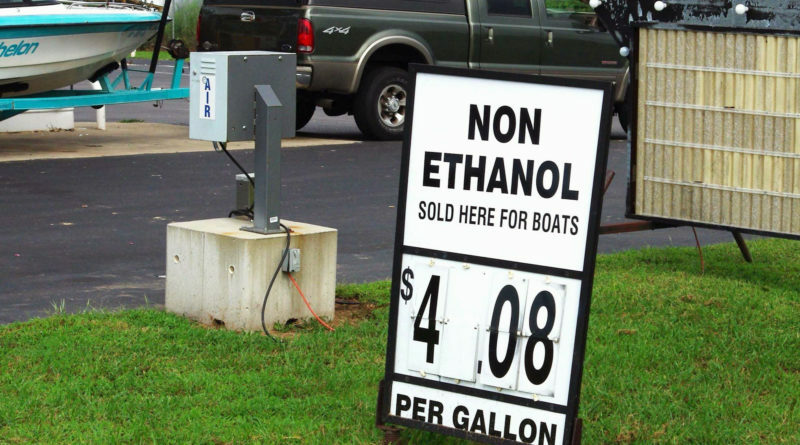 Corn farmers and convenience store operators have advocated for the fuel blend, calling it a cleaner fuel than the other year-round options available to boaters and drivers. A vice president of a company operating more than 200 gas stations stated the summer moratorium on E15 sales was unfair and confusing to the consumer; his statements were made to a convenience store publication and cited in an article recently published by The Log. The marine industry, however, has consistently pushed back on making E15 fuel blends available year-round. E15 blends, they state, damage engines and fuel systems. Manufacturers also void engine warranties if it is determined the boat owner filled up with E15 fuel. Misfueling has also been an issue – where those filling up might not know they are pouring E15 fuels into their engines because of improper or absent labeling. “The EPA’s legally questionable decision to allow year-round sales of E15 needlessly puts millions of American boaters – not to mention hundreds of millions of people with chainsaws, generators, and lawnmowers – at an increased risk of misfueling just so a powerful, politically important constituency can reap a financial windfall. NMMA is adamantly against this proposal and we encourage the administration to abandon this reckless policy,” Dammrich said in a released statement. “EPA’s efforts to inform the public about the dangers of E15 are woefully inadequate, leading to consumers using incompatible fuels that destroy their products,” Dammrich continued. A news report published by TheHill.com stated most fuels currently sold in the United States contain up to 10 percent ethanol – which is safe for marine engines. Only 1 percent of gas stations sell E15 fuel, the article continued. Sales of E15 fuel blends are not permitted between June 1 and Sept. 15 of each year. Only vehicles with flex-fuel engines are allowed to fuel up with E15 during the moratorium. Ethanol in gas has been proven to be destructive of engines and fuel components, lowers gas mileage and actually creates more smog. Plus, it takes well over a gallon of oil to create a gallon of ethanol. So why exactly are we being mandated to use it? Oh, that is right, the politically connected profit off of it, while us peons get screwed. I totally agree with you. The public gets to hold the bag and even winds up paying the penalty while the corn lobby licks their chops. Let farmers grow food not poor fuel that does not really improve anything but a small group of peoples pockets heavy.